These multi-media pieces were created first with a dry brushed acrylic background on black paper - no water allowed. We put these up to dry and created our symmetrical Luna Moths by drawing on one side of a folded paper with pencil, closing it up, and rubbing the back with the end of marker to create a mirror image. 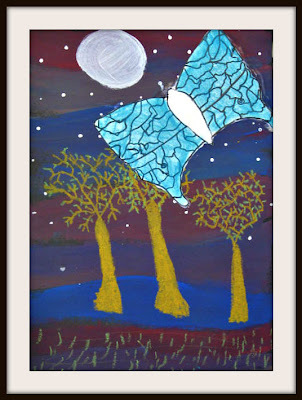 We learned that moths are active at night(hence the name Luna for moon) unlike butterflies who are active in the daytime. And unlike butterflies, Luna Moths have no mouths, so cannot eat. 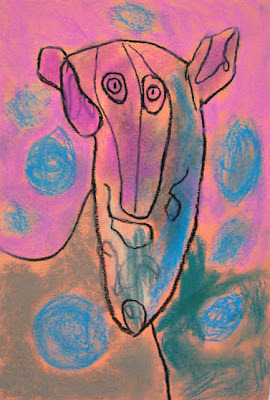 For this reason, they only live about 1 week. We looked at pictures of them and noticed their beautiful shade of light green and how they have spots on them that look like eyes. 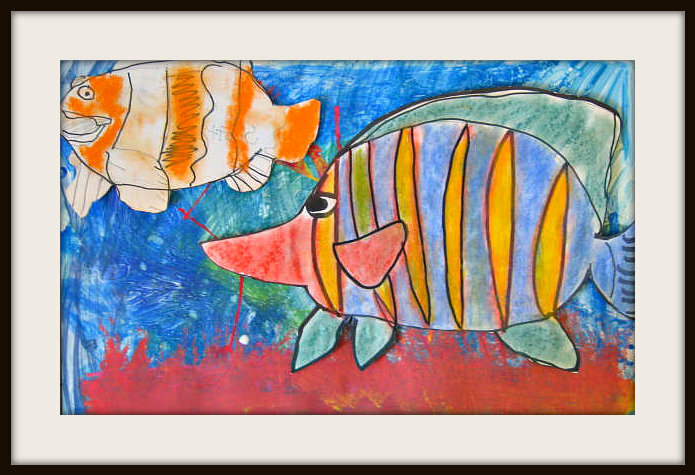 With their observations, the children added more details to their drawings. 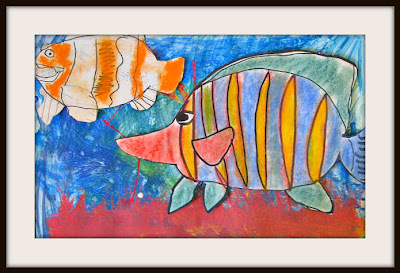 Lines were gone over in Sharpie and color was then added using chalk pastels. 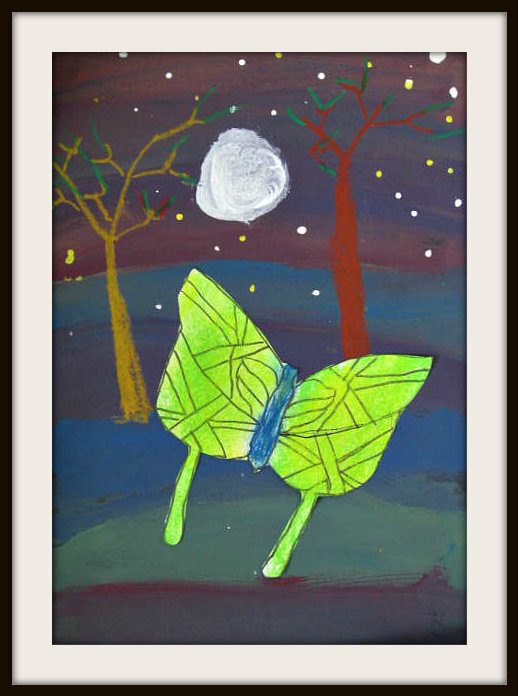 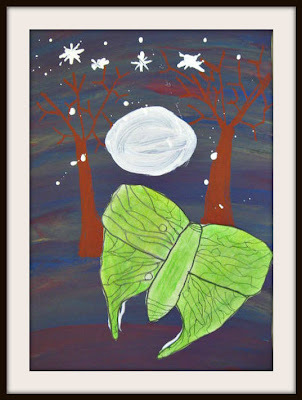 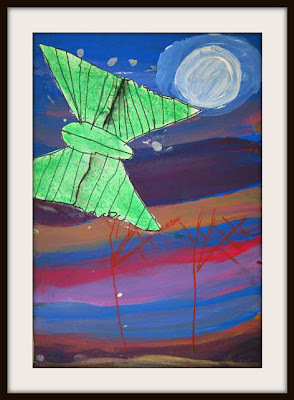 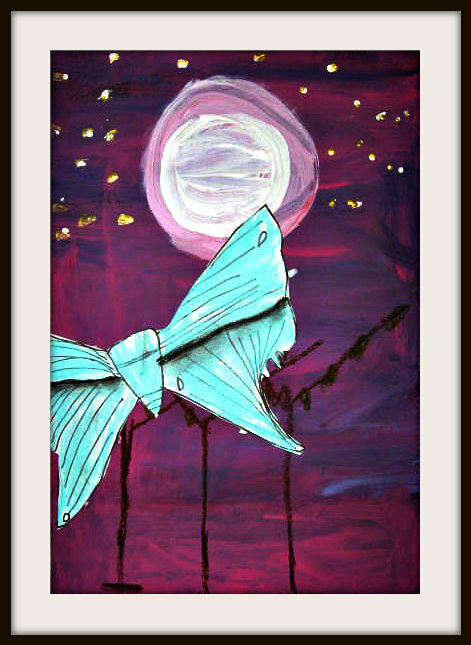 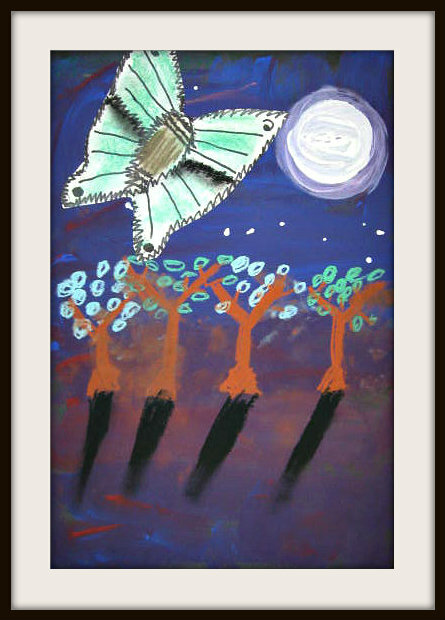 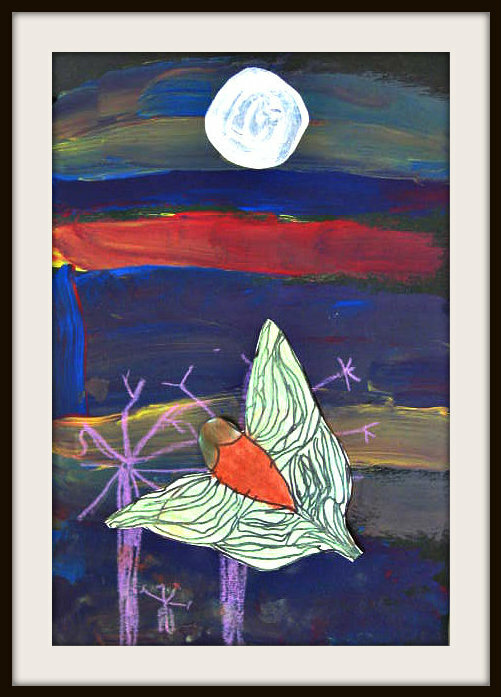 Before cut moths could be glued to their moonlit landscape, trees were added with oil pastel and moon and stars using acrylics. 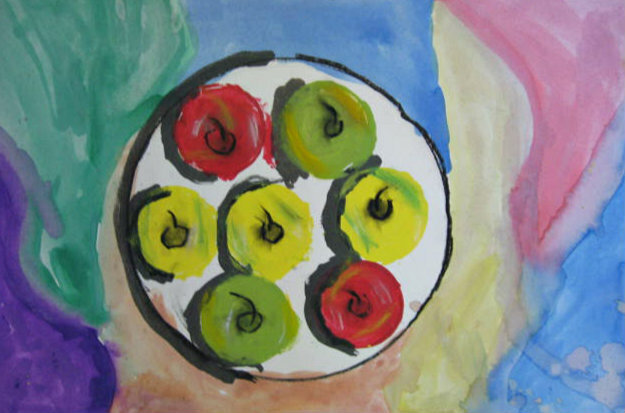 I was very pleased to see my group of K thru 4th putting their own unique spin on this project. Well done guys! I've had a fun few weeks exploring a variety of media and techniques with you! This project has been on my back burner since, well....the pre-Pinterest days. 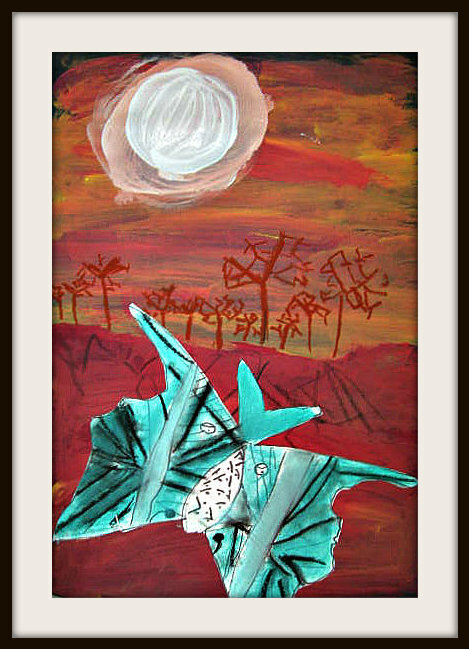 Wow, how did we survive?! 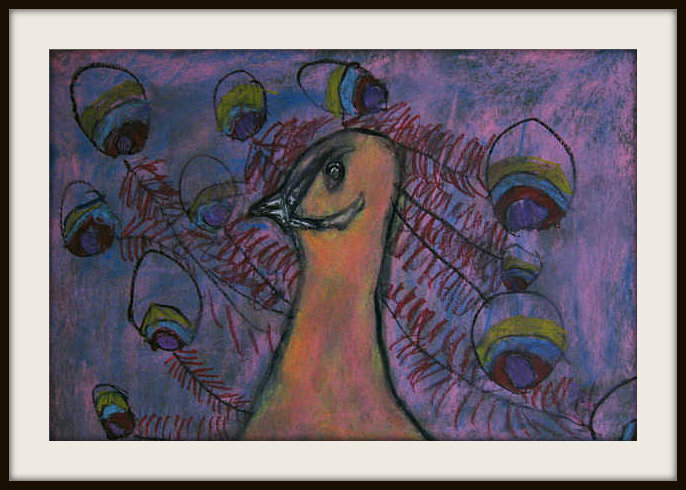 : ) I found this gorgeous collection on Artsonia and knew I had to give it a try one day. 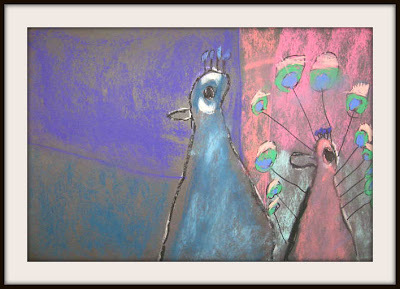 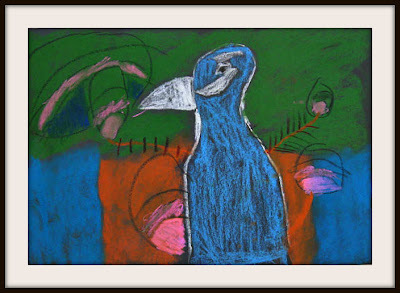 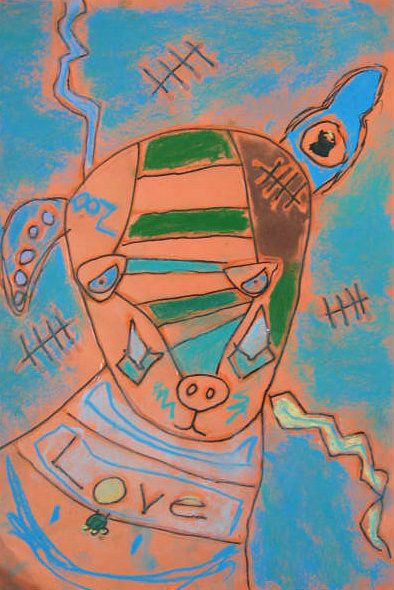 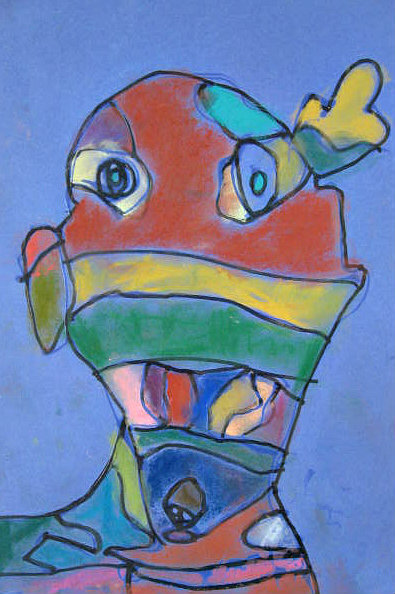 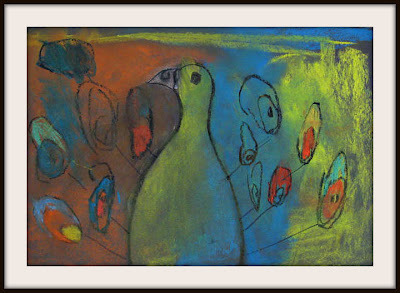 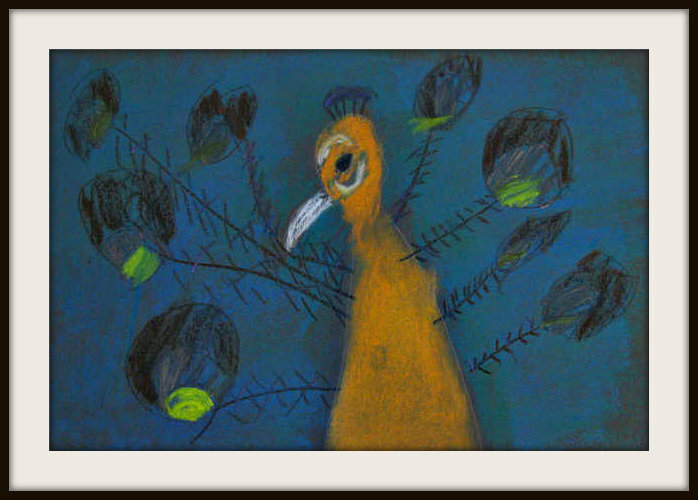 The children (K-4th grade) started out by drawing the beak and body and then added color to the background and body with chalk pastels. 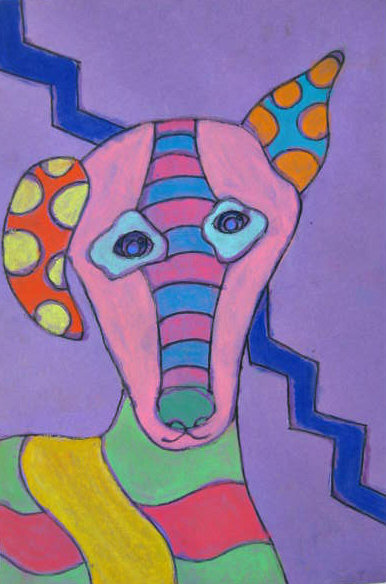 They could choose a realistic color scheme or a very imaginary one. 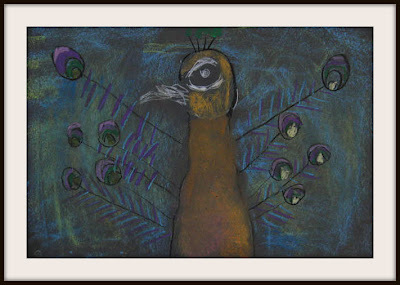 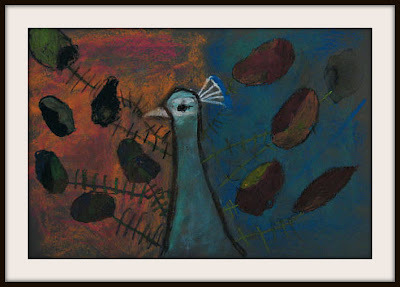 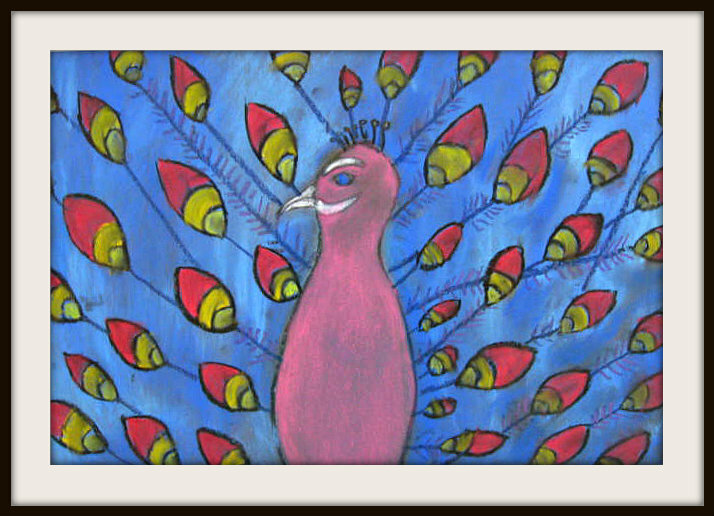 The next step was to add the "eyes" of the feathers and attach them to the body using chalk or oil pastels. 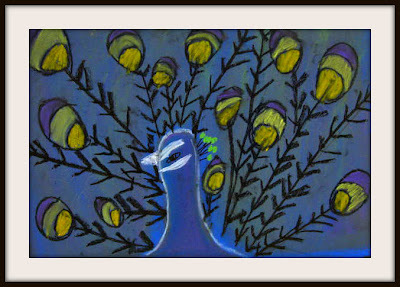 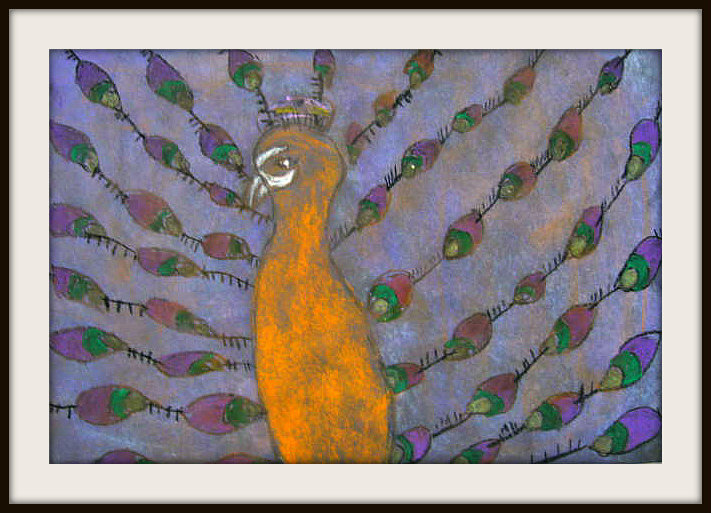 Peacocks are a favorite subject of mine. 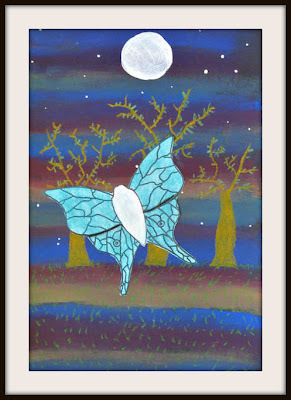 It was fun approaching an old standby in a new way. 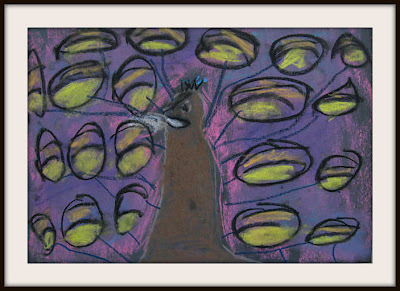 The look of chalk pastels on black paper makes for a nice smokey effect. 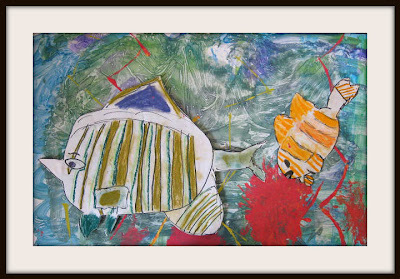 Well done guys...nice original pieces! I originally saw this project on Artsonia and then again on Fine Lines and The Teaching Palette. 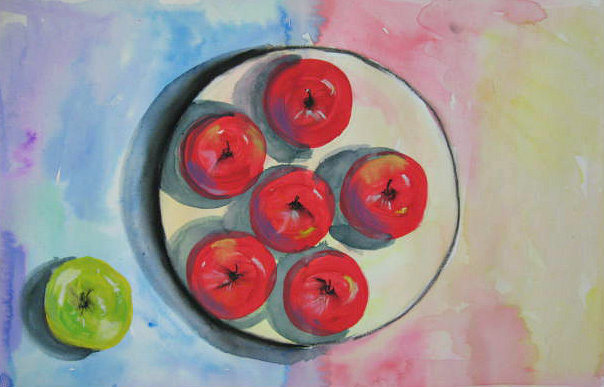 I was happy to finally give it a go with my Drawing and Painting class today. 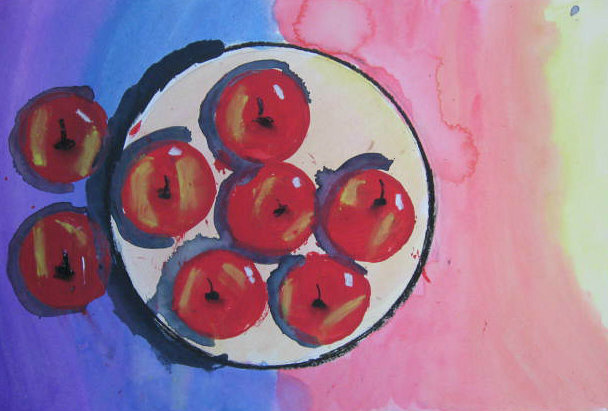 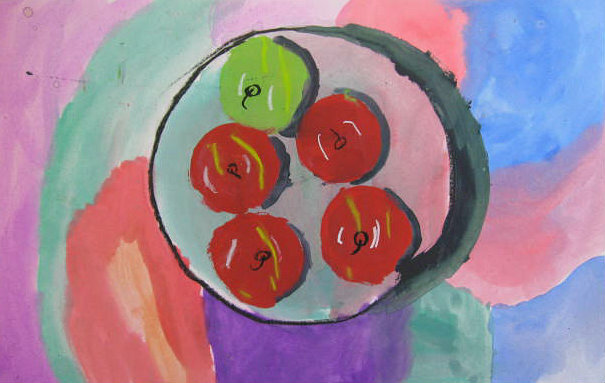 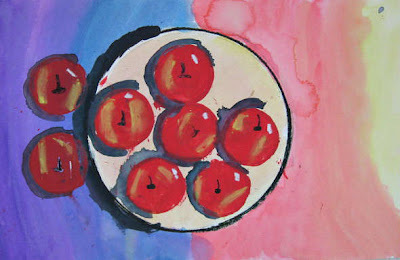 After looking at Matisse's "Apples" of 1916 as well as the shading in Cezanne's apple still life work, the children traced a plate and used watercolor for the first layer of their pieces. We talked about what a "bird's eye view" was so they understood the perspective of this project a bit more. 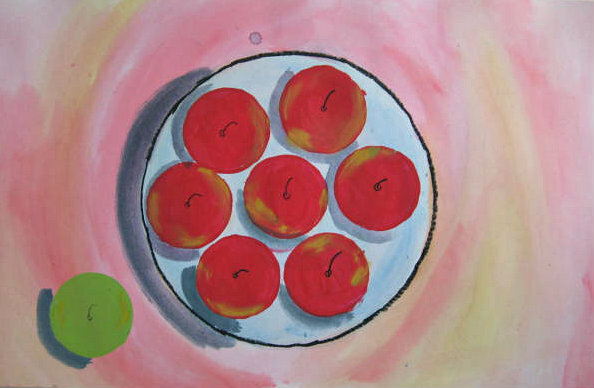 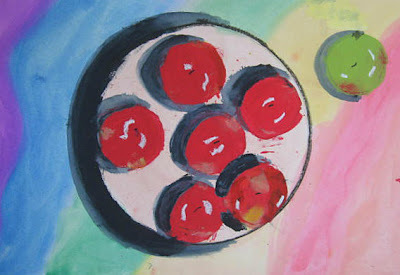 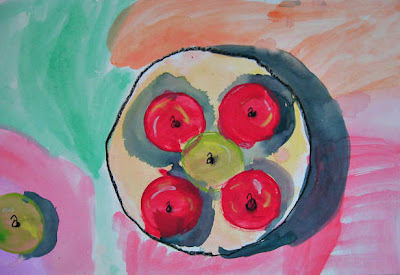 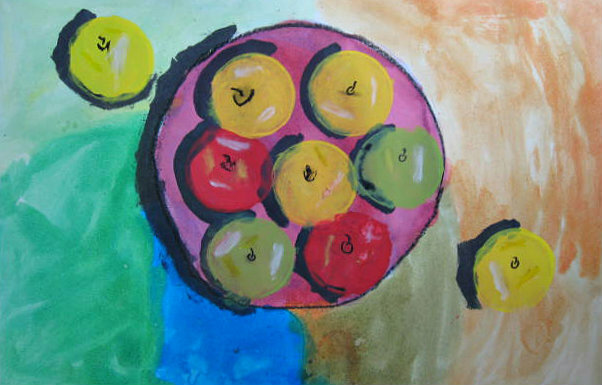 Once dry, they created apples by making prints with paper cups and then filling them in with their paint brushes. 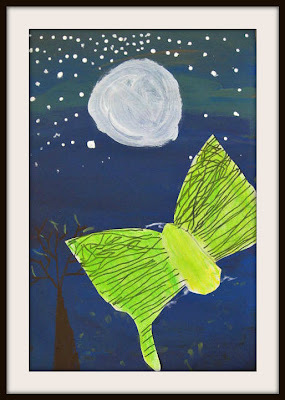 Since I have children ages 5-9, this was a nice way for everyone to feel successful. They created shadows by painting a "C" shape on one side of their apples as well as their plates. 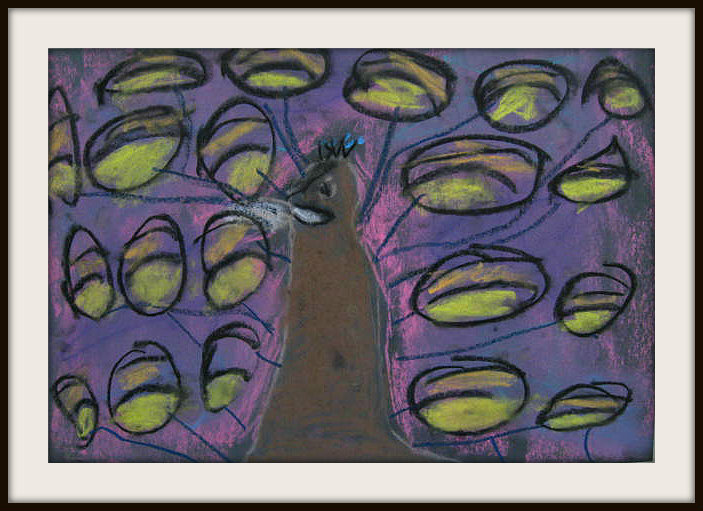 Stems were added with Sharpie and then shaded with a bit of charcoal. 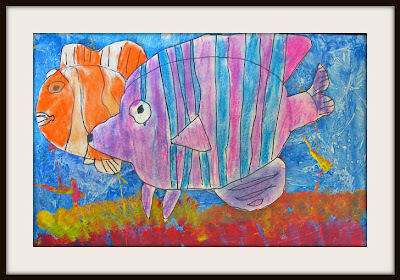 And last, they used chalk pastel and white chalk to add some additional shading and highlights. 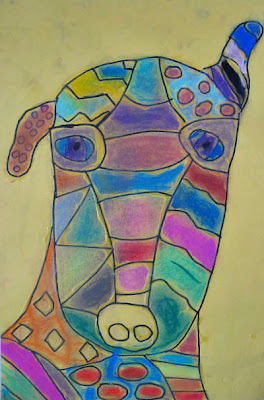 One artist who seems to be heavily "pinned" by art teachers on Pinterest, is Heather Galler. 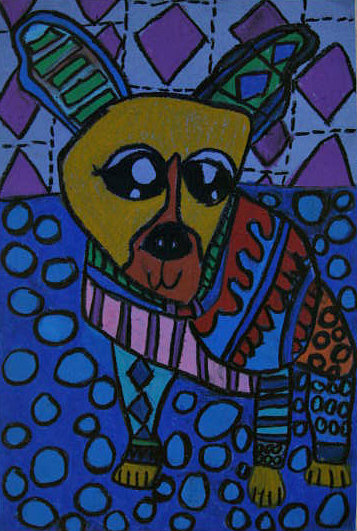 Her folk art style is bold, colorful and has strong design elements ....so it's easy to see why she's so popular. 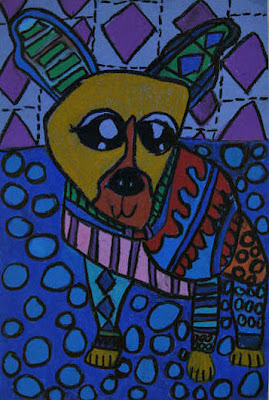 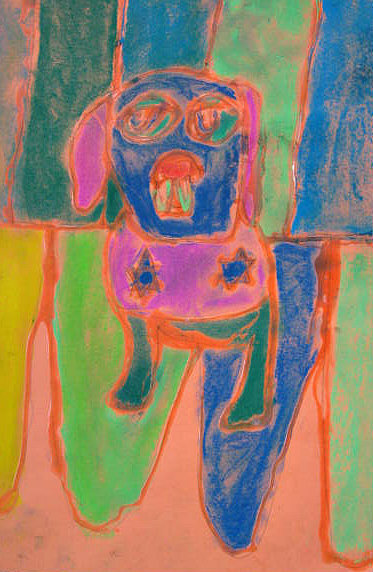 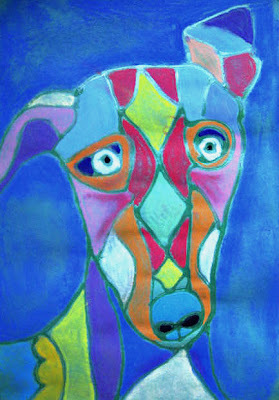 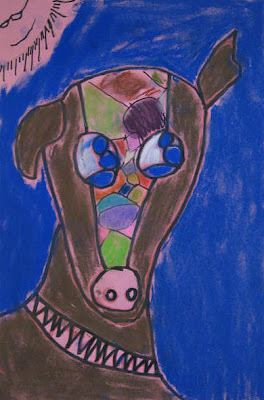 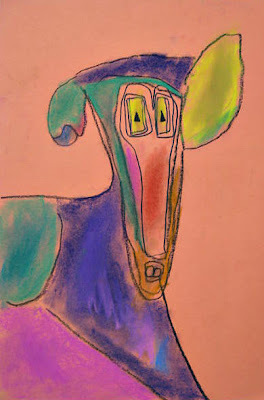 My Animal Art class looked at her her colorful stylized pooches and most decided to use her Greyhound for inspiration. They used Sharpie/glue or both on colored construction paper to create their line work. 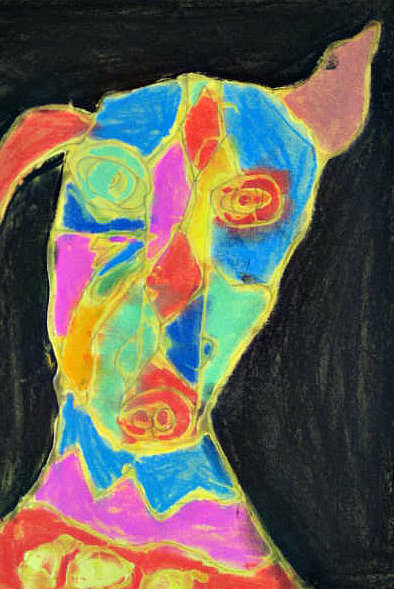 Chalk pastel was used to add bold areas of color. 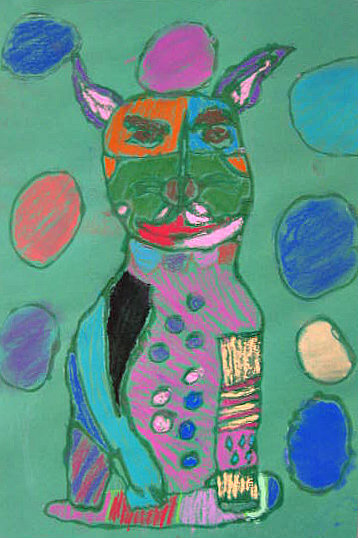 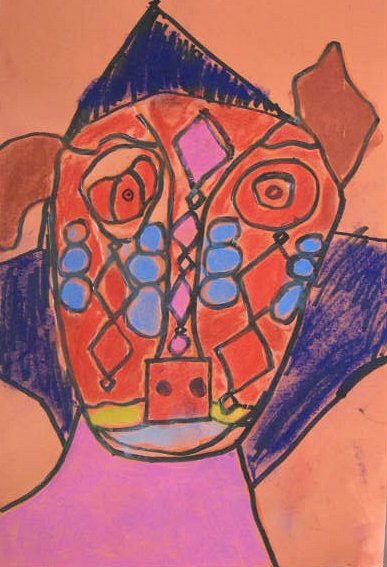 Artwork by K-4th graders. 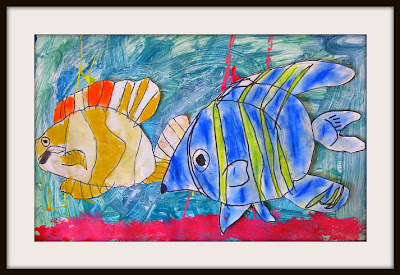 These tropical fish pieces were all about texture and layering. 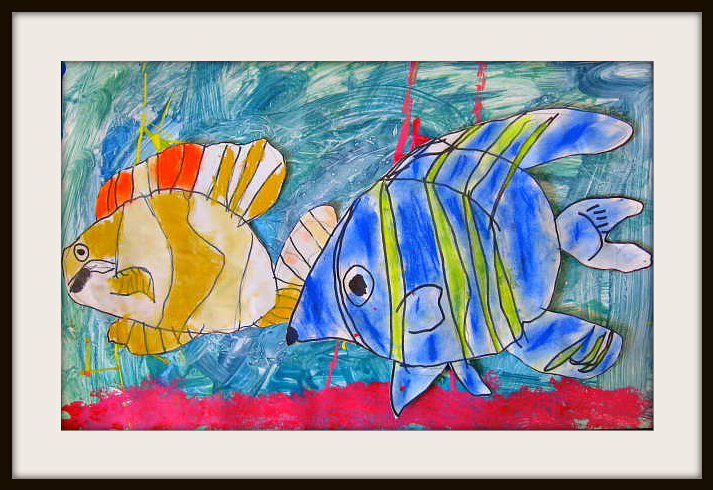 Backgrounds were created with watered down tempera and plastic wrap to create an ocean like feel. 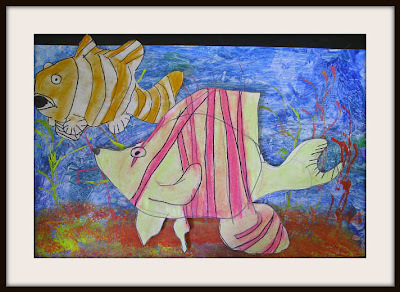 On top of this base the children created seaweed using the sides of matt board to make prints and sponges to create coral effects. 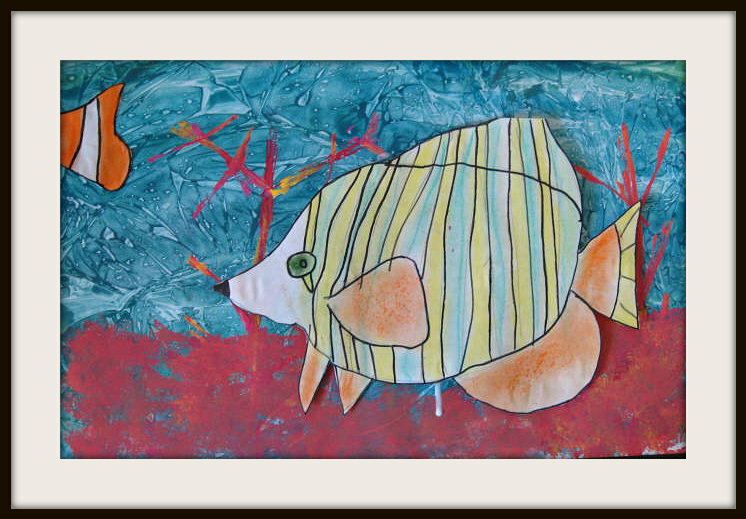 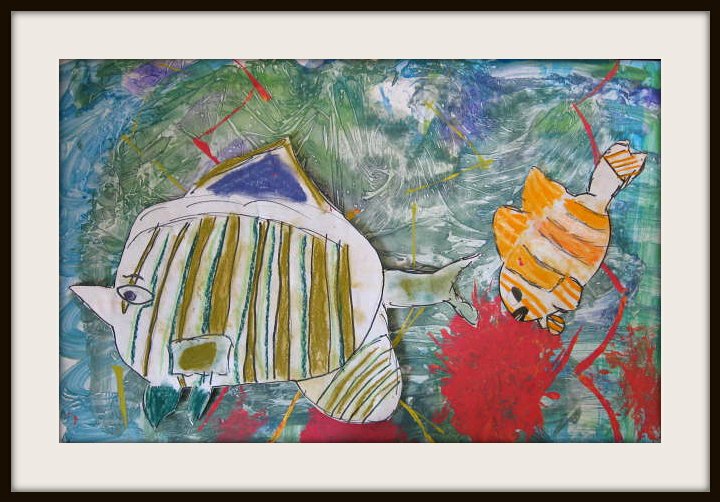 Their chalk pastel Angelfish were cut out and glued to pieces of foam core to give them a 3D effect. 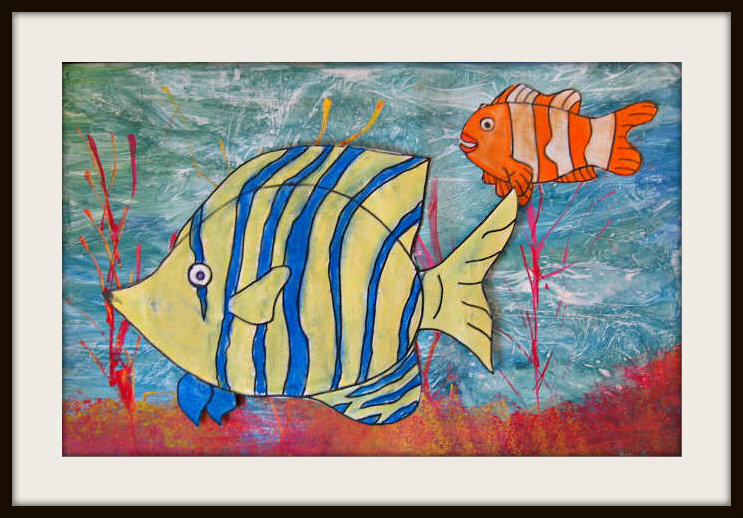 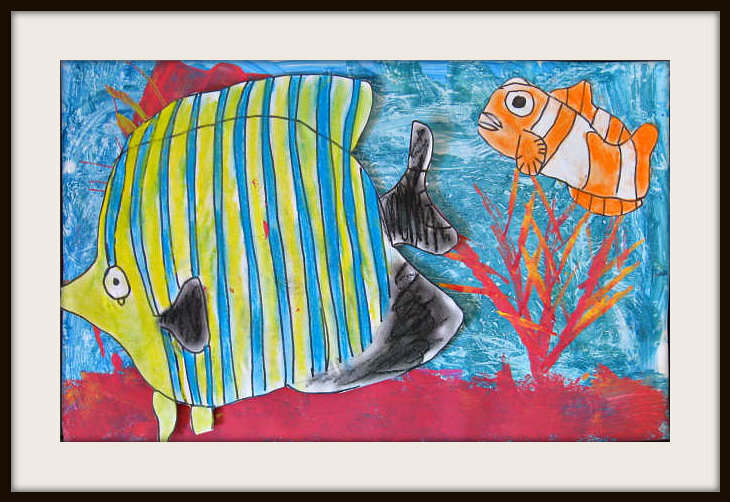 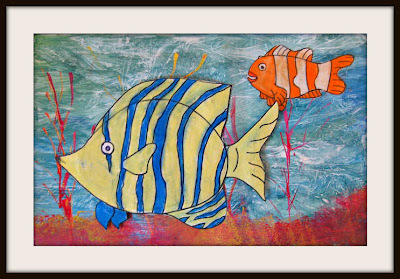 The clownfish or "Nemos" were glued directly to the painted background the give the piece dimension.